Once upon a time, Parvati requested Lord Shiva to explain her about the significance of the Amar Katha. Lord Shiva denied her requests saying that she does not deserve to know about it. Despite several denials, Parvati, kept on requesting to tell the significance of divine Amar Katha. Finally, Lord Shiva decided to tell her the importance of divine Amar Katha. Lord Shiva told Parvati that any creature who listens the story, would become immortal, so this story should be narrated only in a solitude place. Thus, Lord Shiva decided to narrate the story inside the Amarnath Cave so that nobody except the Parvati could listen it. Lord Shiva and Parvati started their journey to the Amarnath Cave from Pahalgaun where he left the Nandi, his faithful vehicle, Moon God at Chandanbari and Shesh Naga at Seshanga. Both Shiva and Parvati left their Pancha Vautik body, the physical body with five elements at Panchatarni and entered into the empty Amarnath Cave with their subtle body. In order to maintain privacy, Lord Shiva requested the Agni Dev, the Fire God to kill all creatures dwelling inside the cave and Agni Dev did so. Due to the grace of almighty god, an egg of parrot remained unharmed and hatched after Shiva and Parvati entered inside the cave. Agni Dev could not destroy the egg because he was requested to kill only creatures and by the time when he killed all the creatures, egg had not hatched. Parvati started listening the story as Lord Shiva began narrating significance of Amar Katha and she nodded time to time. After sometimes, she got tired and fell asleep and parrot chick started nodding instead of Parvati. When Lord Shiva finished narrating the story, he looked at Parvati and saw her at asleep. He woke up Parvati and asked her when she fell on asleep. Parvati told that she fell on asleep when the story was halfway through. Lord Shiva asked, then who was the one listening and nodding throughout the entire story after you fell on asleep­­? Parvati said that she did not know anything about that. Upon hearing that, the parrot chick told that it was he who listened the story and nodded after Parvati fell on asleep. After knowing this, Lord Shiva became very furious and tried to kill the parrot. Afraid parrot fled from the scene and Lord Shiva followed it. Eventually, the parrot reached in the hermitage of Vedvyash Rishi. The parrot entered inside the body of wife of Rishi Vedvyash when she opened her mouth. Thus, Lord Shiva could not kill the parrot. Many years later, she gave a birth to a divine baby whose face looked like a parrot. Thus, he was named Shuka Dev. Since he had listened the entire Amar Katha, he became immortal and a pantomath. He renounced everything including his home, became a saint and started traveling various parts of the world. After sometimes, he decided to narrate the Amar Katha to everybody, so many peoples started gathering around him to listen the divine Amar Katha and whoever listened the story, became immortal. Narrating the divine Amar Katha to everyone was against the law of nature and unethical. When Lord Shiva became aware of this practice, he immediately withdrew the power of Amar Katha so that nobody could become immortal after listening it. However, even today, it is believed that listening divine Amar Katha helps to cleanse the sins of a lifetime, attain greater spiritual merits and happier life. 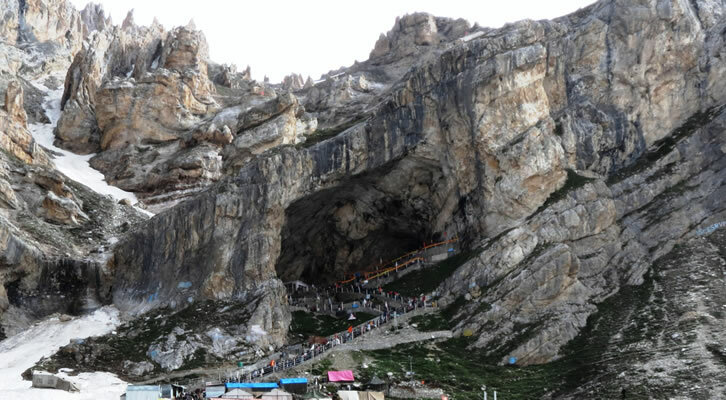 Thus, many peoples from various parts of the world make a holy pilgrimage to the Amarnath Cave for their well-being and peaceful life.